After registering via Wild Apricot, please also go to the link below to register to donate an item for the event. 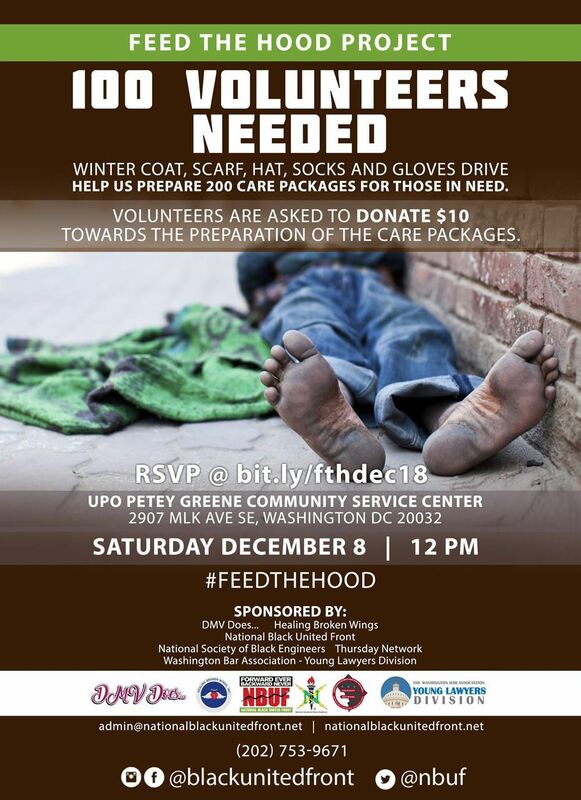 The National Black United Front (NBUF), Thursday Network, and other community partners will collaborate on the Feed the Hood Project which will occur on Saturday December 8, 12 pm at the Ralph Waldo 'Petey' Greene Community Service Center 2907 Martin Luther King, Jr. Ave. SE Washington, DC 20032. Our goal is to meet there and assemble 200 care packages for those in need, east of the river in Washington DC. Once the preparation is complete, we will distribute a portion of the care packages at the intersection of Malcolm X Ave SE and Martin Luther King Jr. Ave SE. The remaining care packages will then be delivered to the Harriet Tubman Women's Shelter and the 801 east Men's Shelter.